The GOG.com version of the game lacks online multi-player. Use the Widescreen resolution and Windowed fixes. No letterboxing for open islands, letterboxed to 1916x854 in caverns. Through the Windowed hack with "Border" set to 0 in the ini file. Through the Windowed hack, as "VerticalSync" in the ini file. It is possible to set any screen resolution up to 32767x32767 through the ReSolution plugin. Letterboxing starts at sizes greater than 6012x2902 for open-island maps, and 1916x854 for closed-cavern maps. Multi-monitor support is possible by combining this plugin with the windowed hack (see below) and manually adjusting the total screen resolution in the settings file. In combination with the winowed mode hack it's also possible to optionally zoom the game (via the mouse wheel, keyboard or touchscreen) and be able to resize the game's screen real estate using the respective options. Alt+↵ Enter will optionally switch between borderless fullscreen window fill and a nonfullscreen window. Since version 0.4, ReSolution supports Worms World Party as well. 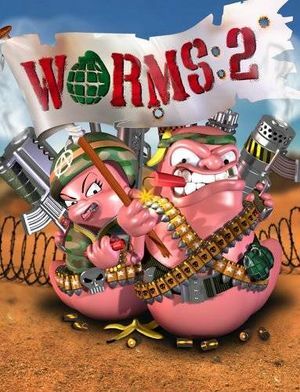 It is possible to run Worms 2 in a window through a windowed mode hack, either with or without the window border. It will also perform an external conversion of the 8-bit palette to 32-bit, resolving the color issues on Windows Vista and 7, as well as improving performance on Windows 8 and newer. It can be combined with the ReSolution plugin to change the window dimensions, independently of the GPU/monitor capabilities. 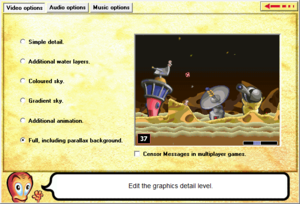 It's possible to zoom and resize the game combined with ReSolution when using this hack. The "VerticalSync" setting, enabled by default, synchronizes the displayed frame rate with the monitor refresh rate. See the link for more details. Uses DirectSound defaults. Can be force-disabled using the windowed hack with "UseFGCGetForegroundWindow" set to 1. Download the 7-zip archive found here and extract its content in the game root directory, overriding already present files. This page was last edited on 15 December 2018, at 04:55.